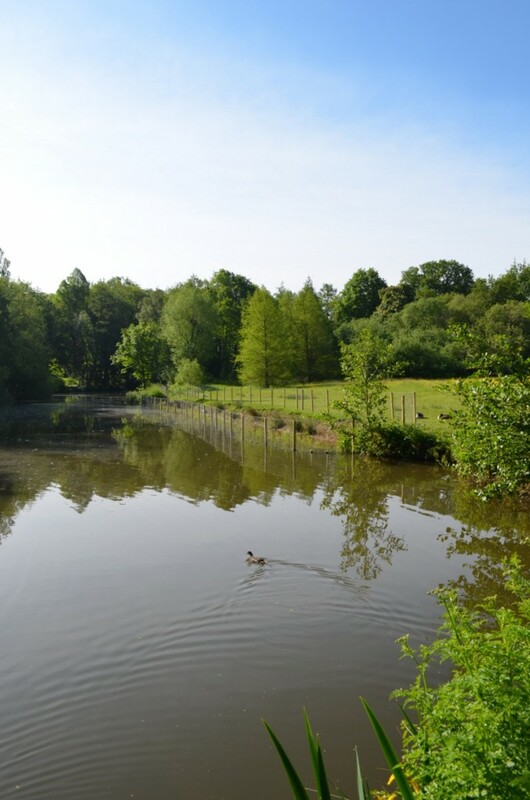 The upper section of Whiteknights Lake showing the newly planted and protected reed beds. Sometimes my walk in to work is so amazing I just have to take some photos. Today I wanted to check on the progress with the developing reed beds that will promote greater biodiversity around Whiteknights lake. The blue sky and nearly windless atmosphere is not good for my hayfever but I’m sure it is good for my wellbeing, and offers a real chance to prepare my mind for a busy day at work. The lake has been in poor biological condition for many years due to overstocking with fish and the large number of waterfowl that get fed with a lot of bread. All this leads to an increase in free nutrients in the water leaving it cloudy and the green-brown colour seen in this photo. Now the fist are being moved the water plants will have chance to re-grow and to clean up the water leaving a series crystal clear lakes and meaning the water that drains out from campus will be much cleaner and better for the local enviroment. This early summer period is also a time for reproduction of plants and animals. I’m hoping very much that these pictures, as well as showing a stunning campus, will help build a phenological record for future research. This entry was posted in Animals, Birds, Fabaceae, Phenology, Plants, Poaceae, Ranunculaceae. Bookmark the permalink.